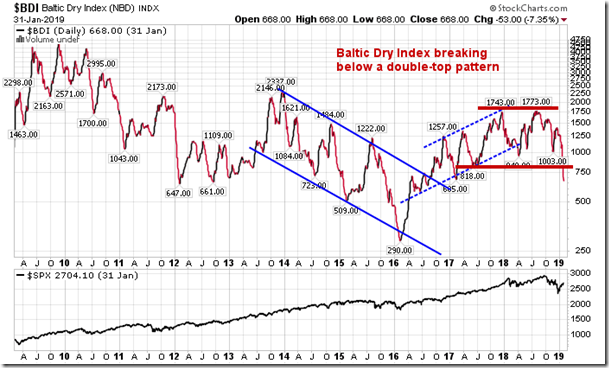 The Baltic Dry Index has declined by over 60% since its recent high, completing a double top pattern. Stocks in the US closed mildly positive on Friday as investors reacted to strong economic data released throughout the day. 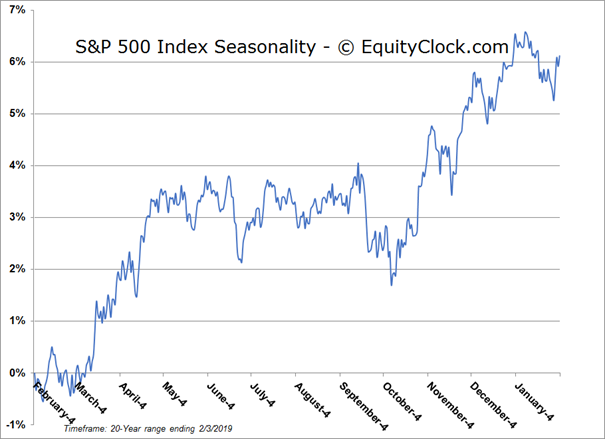 The S&P 500 Index added just less than a tenth of a percent, failing to hold the gain of almost half of a percent seen at the highs of the session. 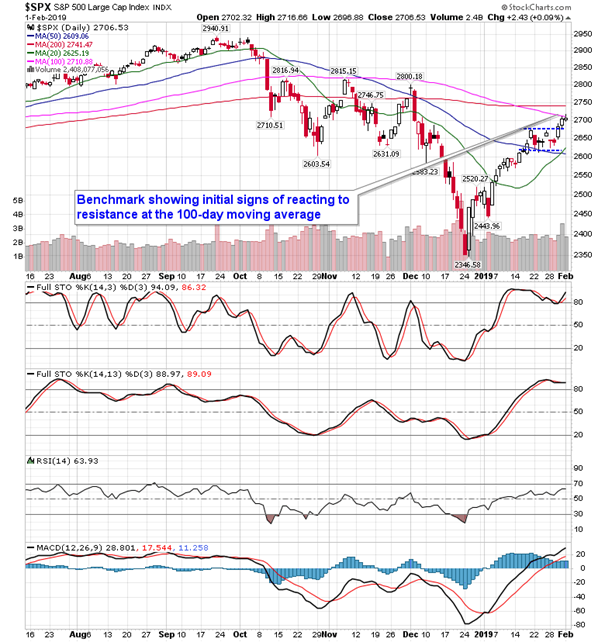 The first signs of reaction to a major moving average level are starting to be seen as investors book profits around the 100-day moving average. 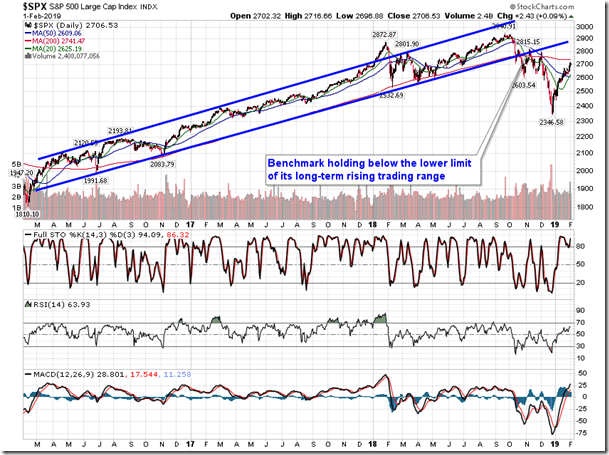 The benchmark first tested this hurdle on Thursday and pulled back ever so slightly; Friday’s reaction to this hurdle was a little more pronounced. 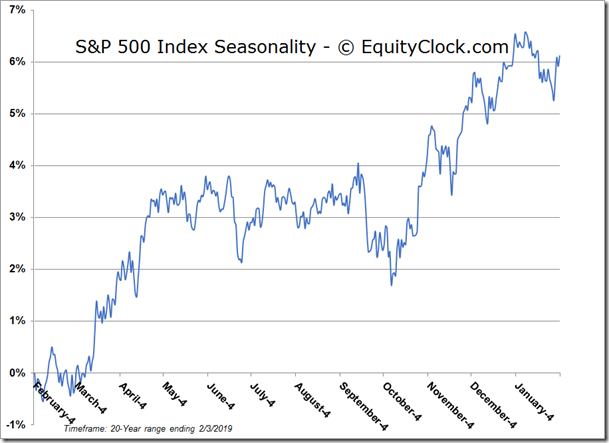 There is a reasonable likelihood that buying demand will fade around present levels as those that benefited from the rally from the December low, or those that have been trapped in positions since the December breakdown point, look to step aside to wait for the next catalyst for stocks. 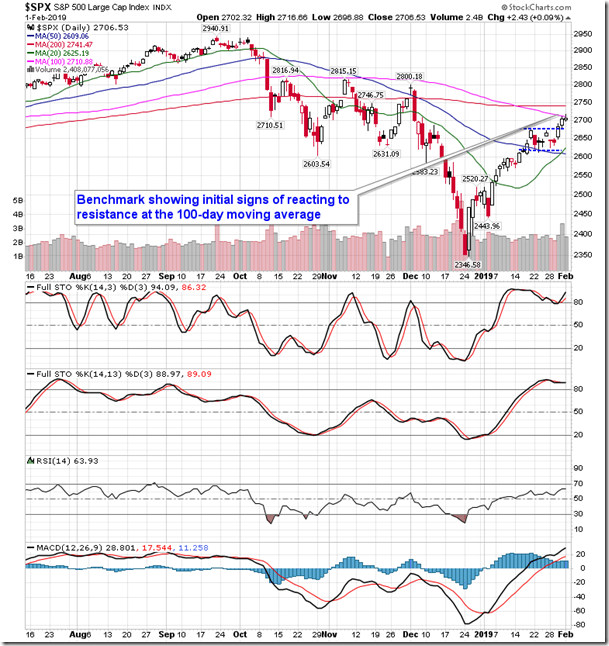 The strength of daily momentum indicators has been waning for the past couple of weeks, leading many to jump the gun on the retracement trade. 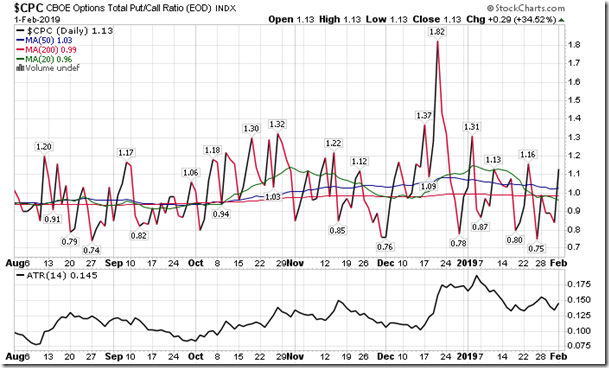 The alleviation of a number of overhanging issues in this market, including progress on trade negotiations and the reduced risk of a more hawkish Fed, have led to a melt-up in stocks over the past few sessions, forcing those that have been cautious to pare back negative bets. 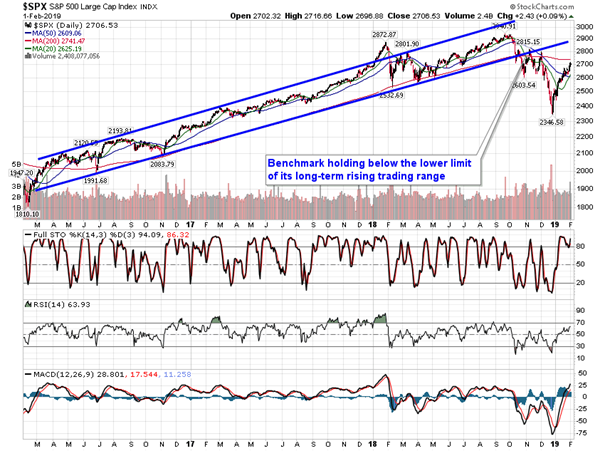 This inevitably places the market in a position of vulnerability, should a shock event be realized. 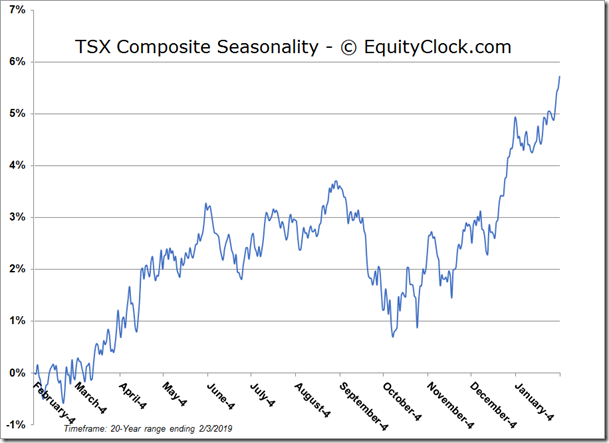 While data and headlines pertaining to the domestic economy are providing reason for investors to venture back into stocks following the December plunge, one leading indicator of economic activity is providing some concerning results. 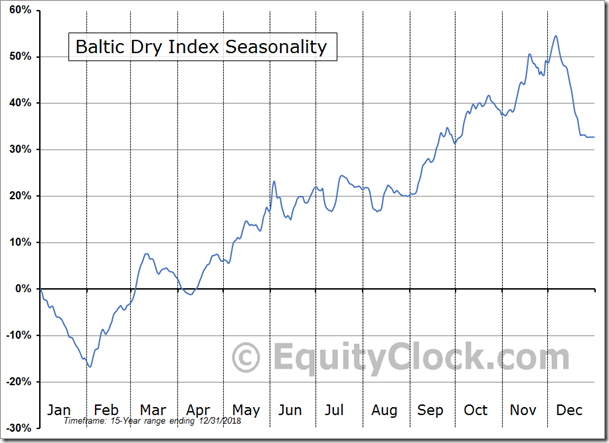 The Baltic Dry Index has fallen by over 60% since rolling over from its recent peak charted in the month of August. 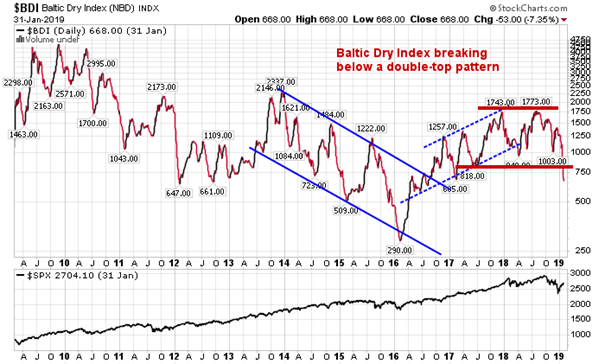 The index of the cost of shipping major raw materials by sea carved out a double-top pattern, the lower limit of which was broken in just the past couple of weeks. 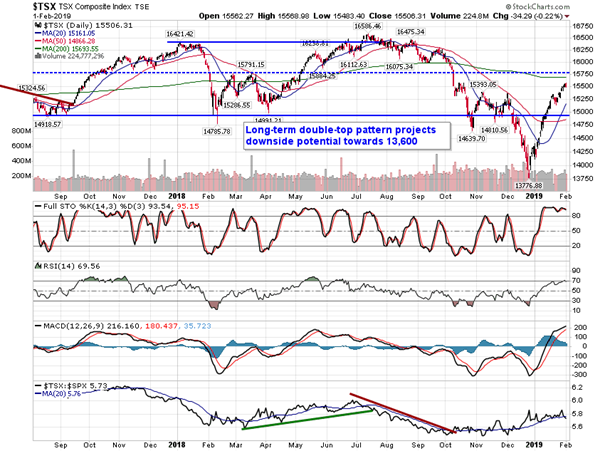 The breakdown projects a move back to the 2016 lows. 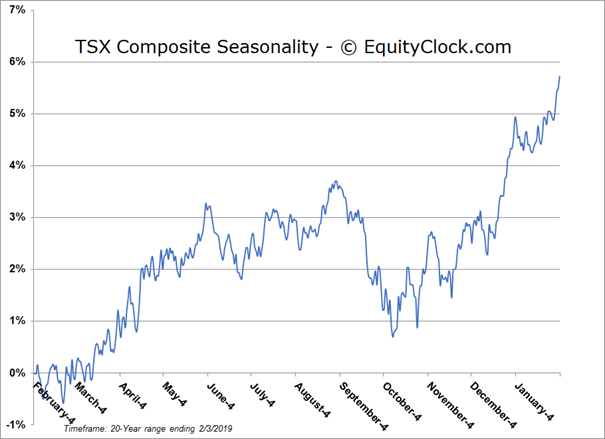 Weakness in this gauge has often preceded periods of global economic strain, such as the late 2015-early 2016 manufacturing downturn, which saw stocks around the globe double-dip following an initial downturn in August of that year. While we could make the argument that the economic situation is “different this time,” the often cited fallacy is almost guaranteed to lead to an incorrect assumption. 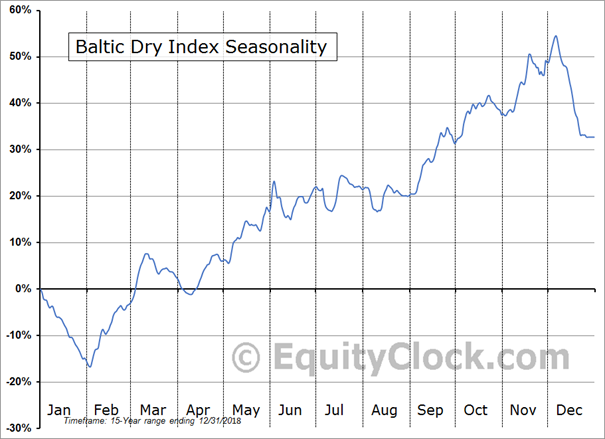 Seasonally, the Baltic Dry Index tends to rise between the start of February and the beginning of June as the manufacturing economy rebounds following winter in the northern hemisphere, but the recent breakdown doesn’t exactly provide the most encouraging outlook. On the economic front, headlines showed another blowout number for employment growth in the US. 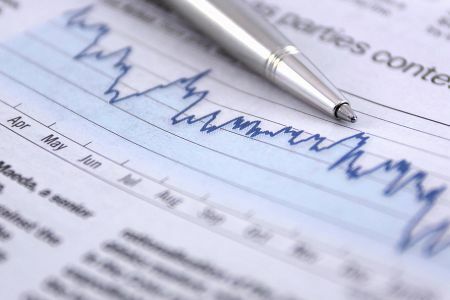 The Bureau of Labor Statistics reported that employment in the US increased by 304,000 in January, far surpassing the consensus analyst estimate that called for a 158,000 rise. 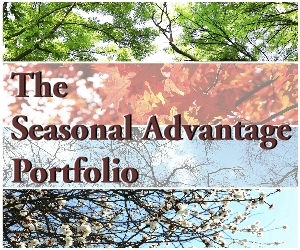 December’s report was revised lower from 312,000 to 222,000 as results were brought forward to the present period. The unemployment rate ticked higher by one-tenth of a percent to 4.0% and average hourly earnings were unchanged at 3.2%. Stripping out the seasonal adjustments, payrolls actually declined by 2.981 million, or 1.97%, which is firmly better than the 2.10% decline that is average for the first month of the year. The result follows a strong year for employment growth in the US when the employment gauge increased by 1.8% in 2018, or nine-tenths of one percent above the 20-year average calendar year change. This was the best year for employment growth since 2015. 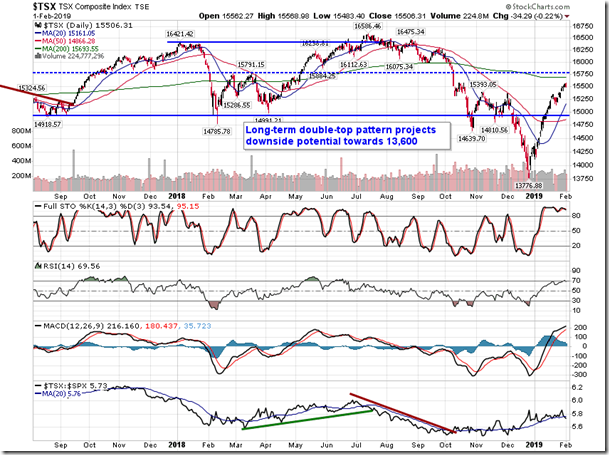 Further insight on this market moving report can be obtained by subscribing to our site and we’ll send you our research and analysis directly to your inbox. 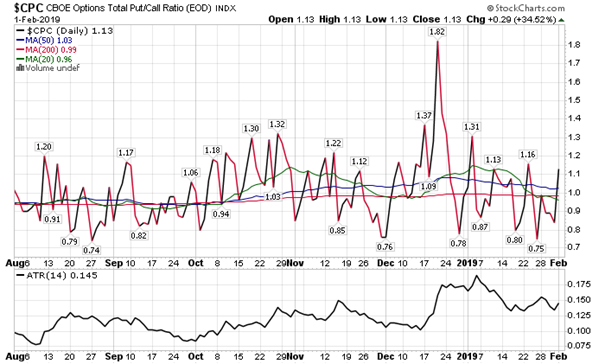 Sentiment on Friday, as gauged by the put-call ratio, ended bearish at 1.13.